Ads extension are additional Information on the ad text. 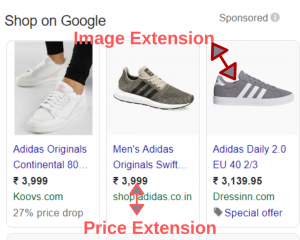 In this blog, we have explained how ad extensions would help you optimize your online ad campaigns and also we made sure that everyone has a grasp of the term Ad extensions. First of all, how many of you use ad extensions? If you already know how an ad is set up and how campaigns are run for maximum ROI (Return on Investment) you already know what an ad extensions is. But, if you are a beginner this article would help you a lot. So just relax and don’t blink. It highlights the cause of an ad being displayed and most of the time they are potential game changers. A study by Google has shown that including ad extensions could possibly boost your CTR (Click through rate) by 10-15 % depending on your business and how you use them. Who would not like such a hike when the margins are so tight? It is because Google automatically recognizes the importance of these extensions as value additions to your ad texts. These are called automated extensions. The best way to get contacted directly by a possible opportunity. 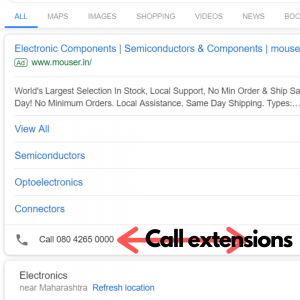 Adding call extensions allows Google to display your phone no in addition to the ad text. Imagine you own a bakery shop and its Christmas; you would like to offer special discounts to customers on online orders placed. You could let people know about the deal online by including call extensions to your ad online. You just drop a line and you have delivered your idea or intent. Adding message extensions gives you an edge as they tend to target mobile devices which have shown greater customer to business engagement ratio. An offer line that adds value to your existing deal would up customers click rate as it’s not about what you sell, it’s about how you sell it. Unique offers, round the clock availability for customers are things that get call outs more often than not. Sharing affiliate locations of your business let people track you down to their nearest location which helps you increase your chances to sell more frequently. If you operate a restaurant chain over a landscape of premises and you got something special for them. You got a make sure the dish is served hot and fresh. Affiliate location extension would help customers reach you faster. Adding short and sweet snippet below your text ad which specifies the range of your business is a good way to provide options to ad viewers. People can quickly decide if an ad is relevant to them or not. Make sure that you make customers life easy. These are tempting and attractive from the sellers’ point of view. 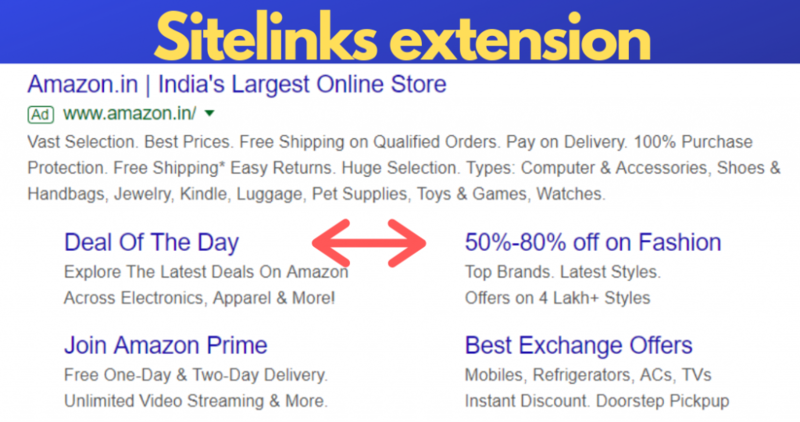 Adding Price extensions linked to your website makes easier for people to find the product or service that you are offering. Make sure you have a good responsive website with a sleek interface and a protected transaction gateway. An ad with an optimized image would help increase your brands reach and would even increase the click-through rate of your ad campaign. Now it’s up to you to slow them down or in the worst case lose them. Make sure they are directed directly to what they want. Site links are links to specific pages of your website that are placed purposefully to complete a supposed action. For instance, if you have a limited offer for a day or week and the product or service page is for a category make sure you guide your customer straight to the destination page where the offer is showcased. If your target is to increase your app downloads use app extensions. App extensions are efficient options to land prospects to your website or to an app store to get them to download your app at their discretion. This could possibly be an app store optimization step. It’s completely human to ask how it felt before trying it personally. Reviews and feedback’s are the sections that transform conversions into converts. Seller rating extensions can be used to highlight your unique customer ratings, which could possibly increase your ads conversion rate. Location extensions can be used to show customers the location of your business which would help them track you down faster. Customers could personally visit your business premise and get a better impression of your brand. The more you personalize the experience of customer the greater will be the conversion rate for your business. Using Ad extensions are a great way to optimize your ads as it would increase your brand’s specifications and would help increase chances of conversion as customers would easily find what they are looking for.